Public Protector Busisiwe Mkhwebane has defended her subpoena on Minister of Public Enterprises, Pravin Gordhan, saying she was not harassing him and is conducting a legitimate investigation. Her office added she was disappointed the subpoena was almost immediately leaked to the media. Fin24 reported on Thursday evening that Mkhwebane ordered Gordhan to submit an affidavit in relation to the establishment of the so-called SARS 'rogue unit', among other questions. The subpoena, dated April 8, includes 11 questions for Gordhan to reply to by April 23, including around the appointment of Ivan Pillay as deputy commissioner of the tax agency. Gordhan's spokesperson, Adrian Lackay, told Fin24 on Thursday afternoon that the subpoena amounted to an "abuse of office" by Mkhwebane. He also criticised the fact that it was leaked. 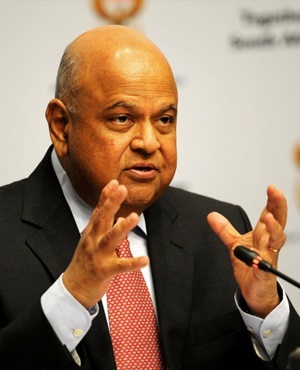 "[The] same set of allegations have been investigated repeatedly by various institutions – including the office of the Public Protector in 2014 – and no conclusive evidence could be found of any illegality by SARS or Minister Gordhan," said Lackay. On Friday Mkhwebane's office said in a statement that the probe was legitimate. "[The Public Protector] has, in the past, subpoenaed and interviewed numerous Ministers, Members of Executive Councils and Premiers as part of investigations. Not once did any of these public office-bearers take issue with this, label it 'harassment' or see it as a source of irritation," reads the statement. The Public Protector's office said the investigation was "essentially a fact-finding mission that can go either way". On Thursday, Gordhan's attorney, Tebogo Malatji, told Fin24 that the question of whether a "rogue unit" has been established within SARS had already been extensively investigated by authorities. He cited a 2014 submission to then-Public Protector Thuli Madonsela, a 2016 investigation by the Hawks, and references to the unit in the December 2018 report by retired judge Robert Nugent. Nugent, the chair of the judicial commission of inquiry into SARS, wrote in his final report he could find no evidence why a special operations unit within the tax agency would be considered "rogue". "Why such a unit was considered to be unlawful is not clear to me," he said. [...] I see no reason why SARS was and is not entitled to establish and operate a unit to gather intelligence on the illicit trades, even covertly, within limits."